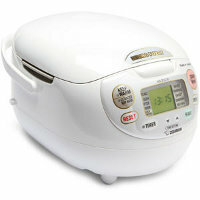 Back in the days where there was no such thing as a rice cooker, you had to figure it out through experience. How much water do you put inside so that the rice doesn’t end up as porridge? Just how long should you cook the rice under a stove, and when do you turn off the fire? All of those survival skills are more or less lost because of the advent of the dummy-proof rice cooker. Enter the Neuro Fuzzy Rice Cooker from ThinkGeek – this rice cooker thinks for itself, where it will make the relevant adjustments to temperature and cooking time, letting you churn out tastebud perfect white rice, brown rice, sushi and even oatmeal. Of course, the $199.99 asking price might be too much for what you’re looking for, but when you take into consideration what it is capable of, it might just be worth every single penny. Capable of cooking up to 5.5 cups of rice at any one go, geeks will definitely love its extra large colored LCD display alongside an easy-to-use navigation control panel. All purchases will come with a rice measuring cup, rinse-free rice measuring cup, nonstick rice spatula, and spatula holder.